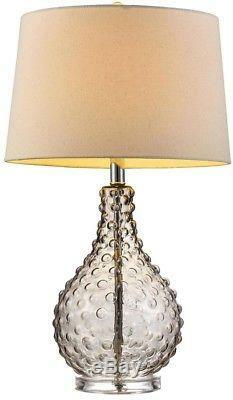 Glass Table Lamp 27 in. Castlerock Drum White Linen Lampshade Acrylic Clear Base. The distressed grey glass finish on this contemporary Glass Catlerock bubble design jar table lamp creates a classic and antique style. Create a stunning accent for any space with this Glass Castlerock bubble jar table lamp. The distressed grey glass finish creates slight discoloration for a beautiful effect. Topped with a drum off-white linen lampshade to complete the look, display alone or in pairs for an eye-catching stylish arrangement. Glass bubble distressed design jar grey glass finish table lamp. Slight drum off white linen lampshade measures 15 in. L Bottom x 13 in. L Top X 10 in. Rotary 3-Way switch located on socket. Maximum 100-Watt type A bulb, CFL or LED compatible bulb (not included). Bulb to socket measures 19.5 in. Acrylic clear base measures 6 in. H, acrylic clear finial measures 1.75 in. Cord length is 72 in. Wipe with a damp cloth for cleaning. : 15 in Product Height in. : 27 in Product Width in. : 15 in Shade Diameter in. : 15 Adjustable Lamp Head: No Base Color/Finish Family: Gray California Title 20 Compliant: No Connection Type: Plug-in Fixture Color/Finish: Gray Fixture Material: Glass Harp Style: Traditional Lamp Base Material: Steel Light Bulb Base Code: E26 Light Bulb Type Included: CFL, Incandescent, LED, No Bulbs Included Maximum Bulb Wattage: 100 W Maximum Wattage (watts): 100 Primary Switch Type: 3-Way Product Weight lb. : 5 lb Recommended Light Bulb Shape Code: A21 Shade Color Family: Beige/Bisque Shade Shape: Drum Style: Cottage, Glam Switch Mechanism: Rotary Certifications and Listings: 1-UL Listed. Our stock all ships from our US-based warehouses. The item "Glass Table Lamp 27 in. Castlerock Drum White Linen Lampshade Acrylic Clear Base" is in sale since Friday, June 22, 2018. This item is in the category "Home & Garden\Lamps, Lighting & Ceiling Fans\Lamps". The seller is "1962tms" and is located in multiple locations. This item can be shipped to United States, Canada.